YouTube Music just got a little bit louder! 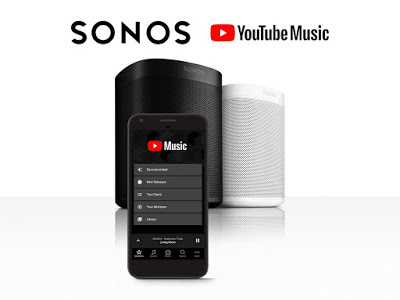 Beginning today, YouTube Music is now available to play on all Sonos speakers. Through the Sonos app, fans around the world with a YouTube Music Premium or YouTube Premium subscription can now easily play official songs, albums, thousands of playlists, and artist radio—on top of YouTube’s tremendous catalog of remixes, live performances, covers that you can’t find anywhere else. Loaded with listening suggestions based on your favorites, Recommended has playlists for your every mood, plus your favorites and last played, ready to go. From Mellow Moods to Energy Boosters to Throwback Jams, quickly find what’s right for you in the moment. Find a collection of the freshest music specifically tailored to your tastes. Listen to newly released songs and albums. This week, my list featured Maggie Rogers, YouTube Music’s latest Artist on the Rise. YouTube Charts are the best way to see what’s hot in music right now. The Top 100 Songs chart catalogs the most popular songs globally, and you’ll also find a local version that’s tailored to what’s trending in your country. This personalized playlist features a mix of your favorites and new songs we think you’ll love. It’s constantly updating, so you can always count on Your Mixtape to deliver a new combination right at your fingertips within the Sonos app. Easily find your saved playlists, albums, and songs in your Library. Available in all countries where YouTube Music and YouTube Premium are available, fans with a subscription can now easily play YouTube Music through a Sonos app. Already have Sonos and ready to try YouTube Music? Start your free trial at youtube.com/musicpremium, and learn more about setting up your account with Sonos here.